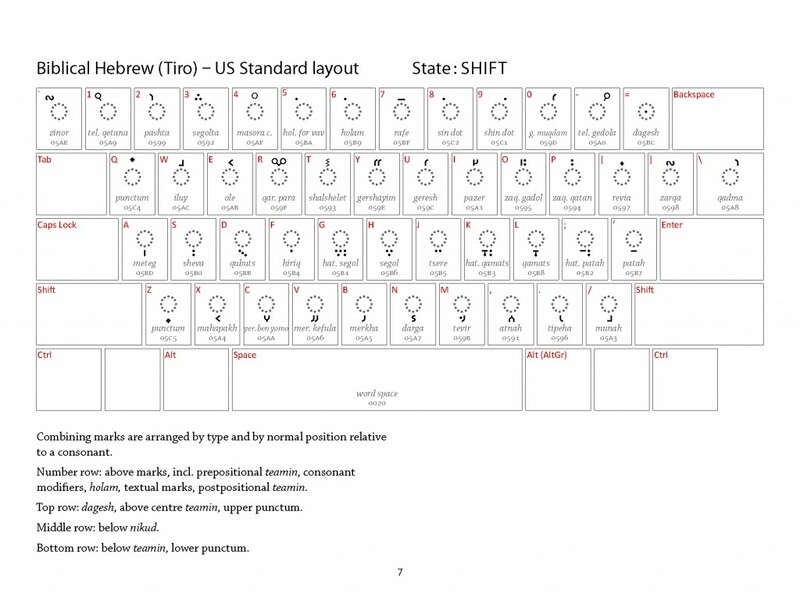 You don’t need to buy a new keyboard with Hebrew keys in order to type in Hebrew. Also, one doesn’t need to purchase any expensive software to type in Hebrew with all of its special vowels, cantillation marks, and punctuation. 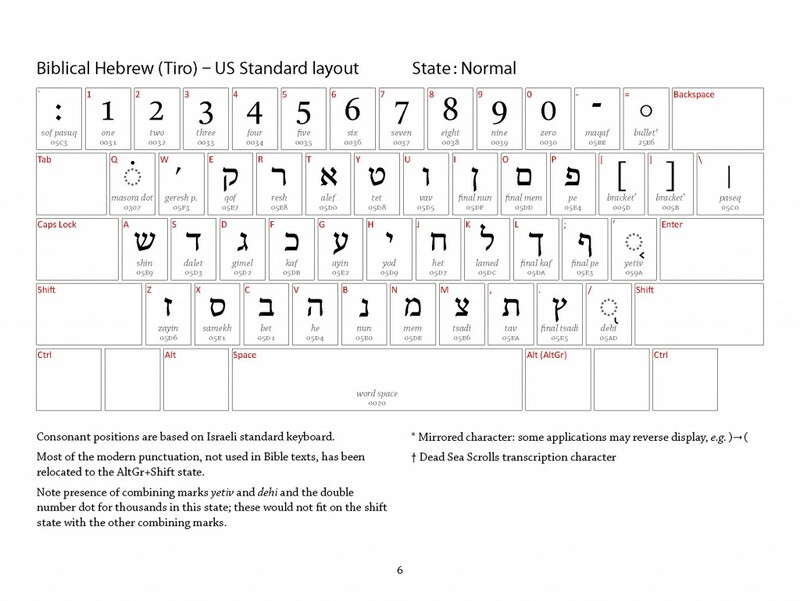 All you need is to install a Hebrew keyboard layout and a set of Hebrew fonts supporting all of those diacritical marks. type *.ttf (asterisk dot ttf) as your search keyword. The search will list all of the fonts in their separate directories. Within the font pack are keyboard layouts suitable for Microsoft Windows and Apple OS X. Linux users can add this keyboard simply by going to their Keyboard settings and following the instructions at the bottom of this post. Installing the keyboard layout in Windows is as simple as running the install file. On OS X, keyboard layout and install. (check here for support. 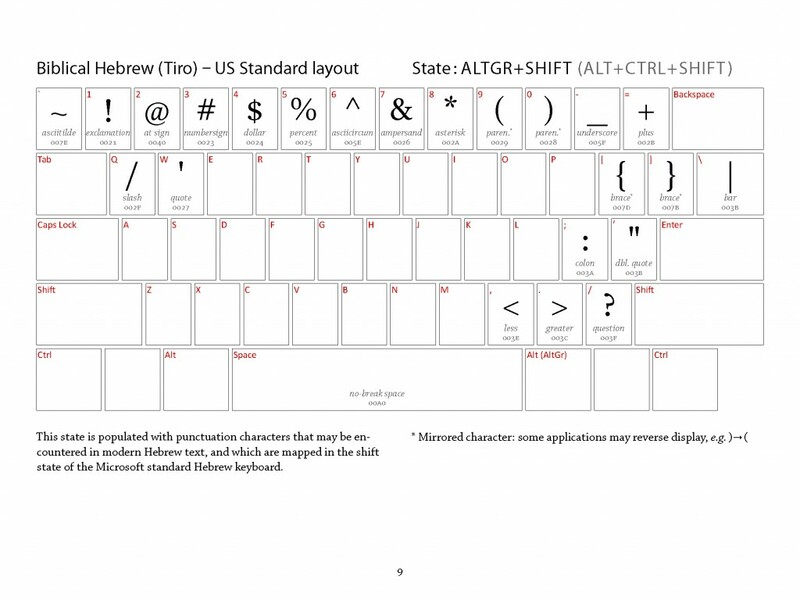 After the install routine completes, open up a capable text editor such as LibreOffice and try out your Hebrew keyboard. (pro-tip: In Windows, you can toggle between your default language and Hebrew by pressing ALT-SHIFT.) 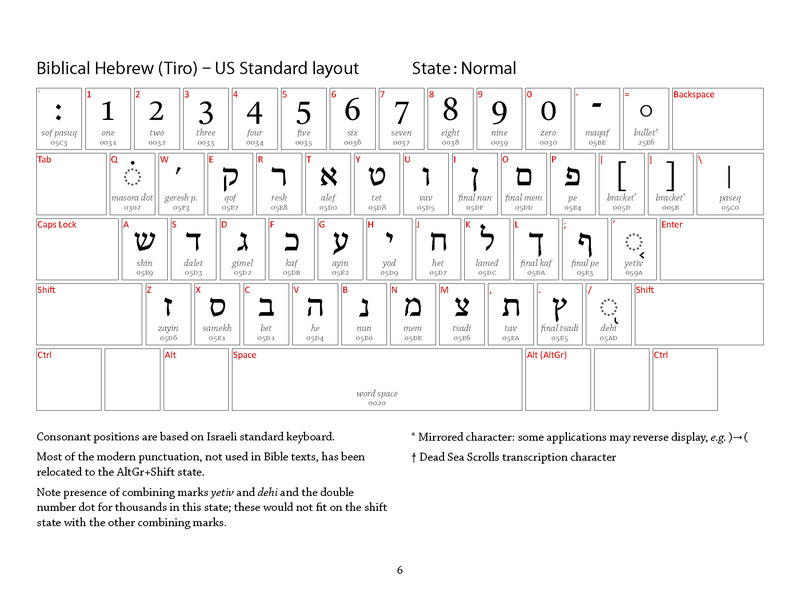 To learn the Hebrew keyboard layout, take note of the images at the bottom of this page. Once you start typing, you should know the following rule: when typing a letter containing a dagesh and a vowel or some other diacritic, first type the letter, then the dagesh, then the additional diacritical mark or marks. when you notice you’re punctuation misaligned and misplaced, you should know why that’s happening and how to fix it. Text editors need to be told to display text as RTL (right-to-left) text. With your Hebrew keyboard layout selected, you can always place an invisible mark at the end of your paragraph identifying your text as RTL. To do so, use the “End” key to move to the end of the line, and press ALT+CTRL 9. This sets an invisble RTL code at the end of the line, so periods and other punctuation should now display correctly. We recommend LibreOffice as a cross-platform and open source Unicode text editor. Follow our setup guide for LibreOffice. 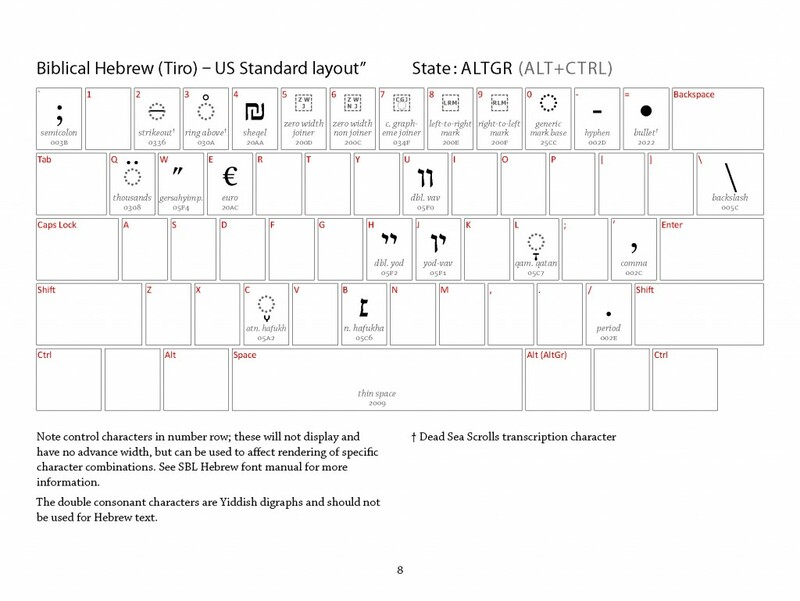 The images below from John Hudson’s Biblical Hebrew (Tiro) Keyboard Manual provide a reference to which glyphs correspond to which keys on the keyboard. The first level is the default level with all of the letter forms and numbers. The second level contains vowels and cantillation marks and is accessed using the SHIFT key. The third level contains additional punctuation and diacritics and is accessed using the ALT+CTRL keys. The fourth level contains punctuation and is accessed using SHIFT+ALT+CTRL keys. select “Keyboard layout.” Make sure that “Enable keyboard layouts” is selected. Go to the “Advanced” tab. Under “key to choose third level”, select a key. The win key (on 104 key keyboards) or the right alt key are good choices. You may also choose a key combination that will switch keyboard layouts (Alt-Shift is a common choice). To switch layouts, either use your chosen key combination or click on the flag in the system tray. Under “Variants”, select “Israel Biblical Hebrew (Tiro).” Press the “Add” button. Click on the newly added layout in the list box.